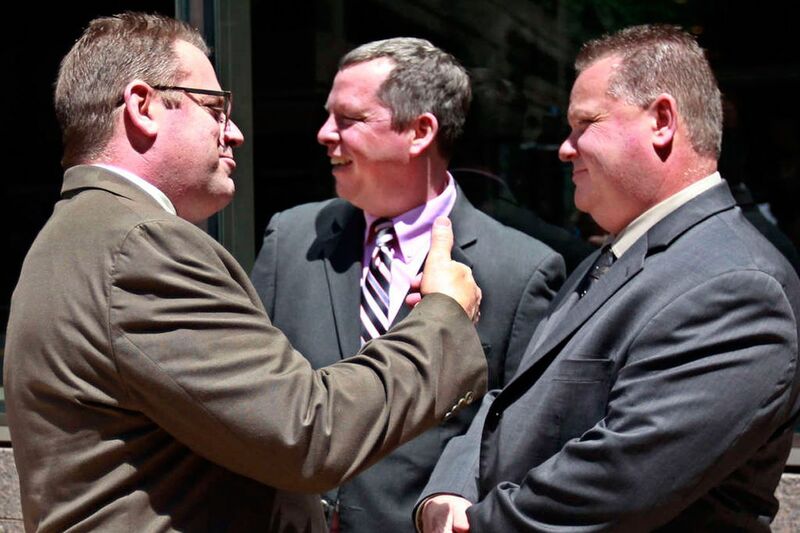 Michael Spicer, left, gives the thumbs-up to fellow defendants Brian Reynolds, center, and Perry Betts as they stand outside after their not-guilty verdict in May 2015. Philadelphia Police Officer Michael Spicer, recently acquitted of corruption charges after being implicated in a wide-ranging federal investigation of police misconduct, was promoted to sergeant Friday in a special ceremony at City Hall. Sgt. Joseph McCloskey, who supervised Spicer and five other narcotics officers charged in the criminal case and testified on their behalf, was also promoted Friday to the rank of lieutenant. A law enforcement source said the Police Department had opposed the promotions, so the ceremony was held at City Hall and coordinated by Deputy Mayor Everett Gillison in lieu of a representative from the department. Police Commissioner Charles H. Ramsey, who fired Spicer and the other officers caught up in the federal probe, saying they had engaged in "one of the worst cases of corruption" he had seen, was out of town and did not attend the ceremony. At the time of the firings, Ramsey vowed to melt the officers' badges. The commissioner's decision to dismiss Spicer and the others - Thomas Liciardello, Brian Reynolds, Perry Betts, John Speiser, and Linwood Norman - was overturned by an arbitrator in July. The firings had been challenged by the police union, and the officers were reinstated. Gillison declined to comment on the promotions Friday. Mayor Nutter's spokesman, Mark McDonald, confirmed that Spicer had been promoted but did not respond to other questions. The Nutter administration reached an agreement with the police union to promote Spicer and McCloskey, who had been passed over on the department's promotions list because of the criminal case, Ramsey said Friday. The commissioner said he had not been part of that agreement. Spicer and the others were charged in a sweeping racketeering conspiracy case in which prosecutors alleged that the officers beat drug suspects, stole money from them, and then filed false police reports to cover up their actions. One witness testified that the officers held him over the balcony of his high-rise apartment and threatened to let him fall to his death if he did not provide information on his drug business. In a blow for federal prosecutors, the officers were found not guilty of all charges. The prosecution case relied in part on the testimony of Jeffrey Walker, a fellow member of the narcotics squad, who pleaded guilty to robbing and beating drug suspects, and who testified against the other officers. Since 2012, the District Attorney's Office has refused to accept testimony in cases stemming from arrests by Spicer, Walker, or any of the other officers implicated in the criminal case. Now that the officers have been reinstated, prosecutors will decide on a case-by-case basis whether to allow their testimony in future cases, said Cameron Kline, a spokesman for District Attorney Seth Williams. To date, 393 convictions in criminal cases that relied on arrests or testimony by Walker and the six officers have been reversed. An additional 89 are scheduled to be reversed Friday, said Bradley S. Bridge of the Defender Association of Philadelphia. There are scores of federal civil rights lawsuits pending against the city charging wrongdoing by the officers, court records show. The six acquitted officers and their former lieutenant, Robert G. Otto, are suing the mayor, district attorney, and police commissioner in federal court. The suit alleges that the city leaders maligned them. A lawyer for Williams has described the officers' claims as "baseless." In September, Betts resigned after failing a drug test. He is no longer on the force.